Ahead of the campaign launch of Gantz's party, Ya'alon, set to form alliance with him, demands he not sit in a Netanyahu government. 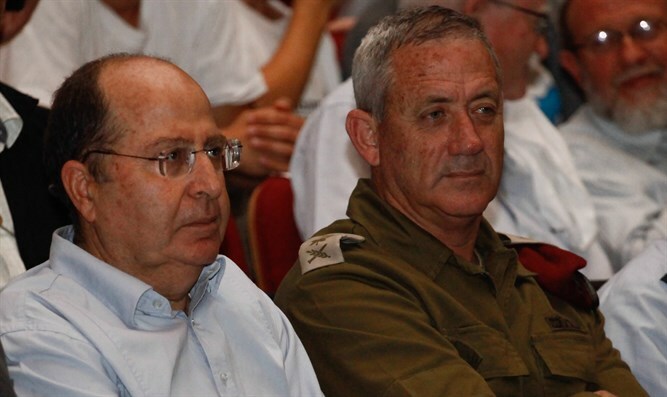 Chairman of the Israel Resilience party Benny Gantz and Telem Chairman Moshe Ya'alon are working to reach an agreement for an alliance, even before the launching of Gantz's election campaign this coming Tuesday. According to the report in Yediot Aharonot, an official agreement has yet to be signed, due to Ya'alon's demand that Gantz commit to not joining a Netanyahu government. The two are making an effort to finalize their negotiations and present a final summary of the matter ahead of the first official Israel Resilience event the day after tomorrow. Gantz hopes that former Chief of Staff Gabi Ashkenazi will also join Israel Resilience. Ashkenazi himself is wavering between Gantz and Yair Lapid, but said that the best option, as far as he is concerned, is to join a large union that could be an alternative to Netanyahu.